Hey everyone! Time for today's challenge mani. A bit crazy looking, right? But I love it! Yellow is not one of my favorite polish colors to wear but liked this manicure! I used my favorite yellow polish, of course. The yellow is Color Club - Almost Famous. I then added dots in Color Club - Poptastic. I finished with a coat of Ninja Polish - Sticks 'n Stones. Does it look to you like big pink glitters and not dots of polish? I think the effect turned out pretty cool. I can't take credit for this cool dots-and-glitter idea though, I saw it on Nail Polish Wars and have been waiting for the right time to make it come to life from my Pinterest board. Haha. Gotta love Pinterest. Sticks and Stones never gets old! I keep wanting to wear it over everything. Perhaps it will make another appearance in the 31 day challenge at some point. We'll see! One last interesting thing to show you guys before I go! The Essence Ready For Boarding limited edition display! OMG! 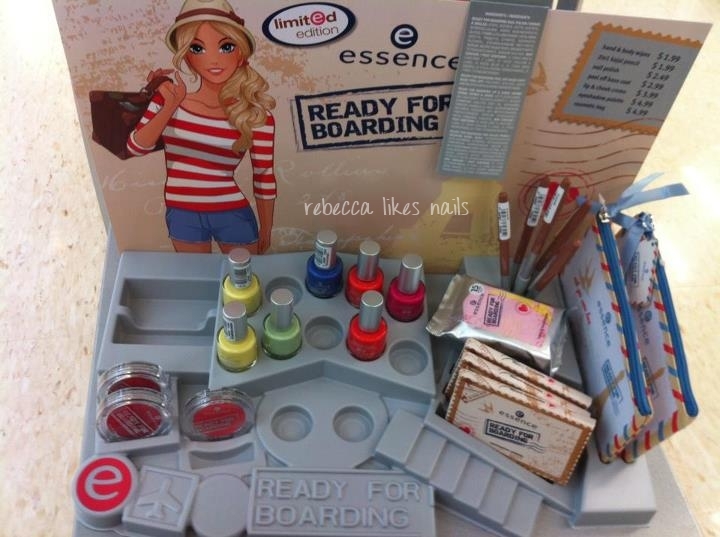 I love that we have Essence's Colour & Go line here and now it seems we will be getting the LE displays too. How exciting! But I didn't manage to get a bottle of the Peel Off Base Coat. I am wondering if perhaps they weren't stocked here - I've been to 4 different stores that had completely full displays except for the base coat. Either someone beat me to every display and took them all, or they just weren't there in the first place. Who knows! Either way, I'm excited to see if we keep getting the cool LE stuff. Canadians, run to Shoppers! I love this, putting the polka dots underneath add a whole new fun dimension to Sticks N Stones. Great pairing! I am totally going to try the dots and glitter technique. I love it!! The peel off base coat is just PVA (or Elmer's glue). You can just use that instead. That's what I use under my glitter polish and it peels right off. omg i love this! i really thought you had a crazy pink black and white glitter! In Germany starting this fall the peel off base coat is actually in their permanent collection. They must have sold well with the ready for boarding LE. Love the dots and glitter! Is it just me or does the yellow look a bit orange? I totally thought this was a pink, black and white glitter topper! Cute! LOVE this mani!! So fun!! I love that you did the dots under the glitter, I never would have thought of that! Oooh I hope I see this Essence display at my Shoppers! It's a teeny one but I think they have space..... fingers crossed!